Green Day is an American punk rock band hailing from the East Bay, California. Formed in 1986, the group has won 5 Grammy Awards and sold more than 85 million records worldwide to date. In 2015, the band was inducted into the Rock and Roll Hall of Fame as a part of the 2015 class in their first year of eligibility. Needless to say, we are very excited to have been invited to work with the band again for the 2016-17 Revolution Radio Tour. For this current tour design, there were several drapery elements to supply. Each portion of textiles supplying a different look and effect for the show. It’s always a treat to work on a project that will have “mid show drapery changes” – giving an ongoing visual impact to the audience. For the main stage Kabuki drape – a giant digitally printed “BOOM BOX design” backdrop was crafted. This piece, nearly 60 feet wide, was digitally printed onto FR Crystal Poplin – for the ultimate in durability and color saturation. We love this printing material as it offers easy packing into a small storage vessel – with space being of great importance on a touring show, it is ideal for this type of project. Both lightweight and durable, it’s a win-win for many projects. The Kabuki drape was deployed during the show using a set of solenoids supplied by Sew What? / Rent What? Inc. This touring package of solenoid heads allows the drape to be released from the air with the press of a button. The system provided by Sew What? / Rent What? Inc is extremely popular because it is very compact, extremely flexible and has a proven record of reliability. If you want to learn more about our solenoid systems and how they work to make a “kabuki drape drop” visit our informational Solenoid System page. Want to see these theatrical backdrop items as they were being sewn? This video showcases the Stage Drapes & Graphic Printed Concert Curtains which Sew What? 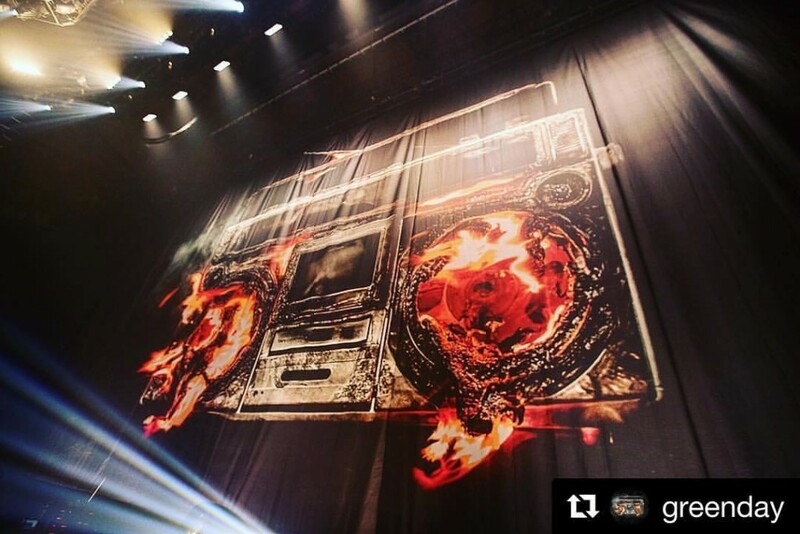 Inc produced for the US portion of the Green Day Tour. In addition to the “BOOM BOX design” backdrop, there were two unique backdrops which comprised a selection of banners (7 banners per backdrop set) and these were hung and dropped by solenoids so that they ran down aircraft cables landing neatly on the floor securely behind the band. These red and blue banner sets were certainly dramatic! If you are interested in seeing examples of the many different backdrops and backdrop styles that are available visit our Flickr Galleries and take a look around. 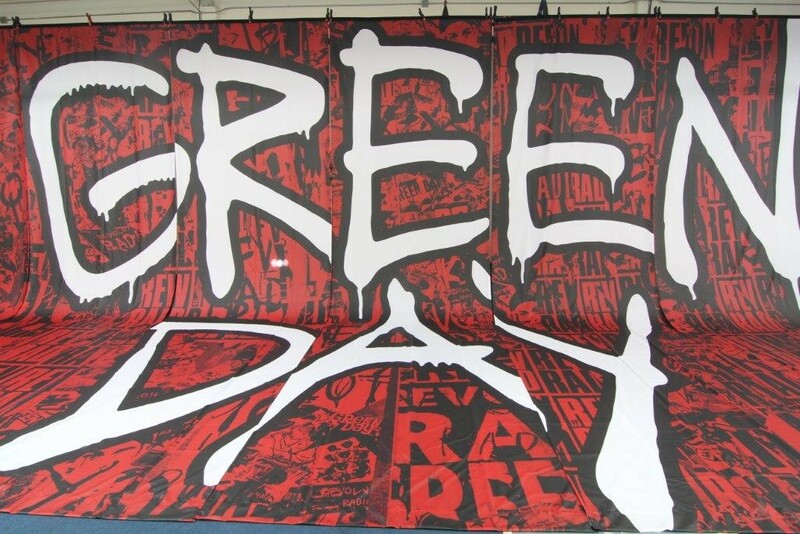 Green Day have a massive Black Rip Stop lightweight masking drapery package on tour with them as well. This lightweight, water resistant, and durable textile is one of the rock n roll “go to” fabrics for big arena shows. But there are plenty of materials to choose from…… just take a look at the various theatrical fabrics available from Sew What? Inc.
Sew What? Inc., located in Rancho Dominguez, California, is a well-known stage and theatrical drapery manufacturer known for its dramatic theatrical drapes and fabrics used in major rock concerts, top fashion shows and other artistic staged venues. Our drapes and #backdrops have dressed the stages of Miley Cyrus, Carrie Underwood, Madonna, and Rod Stewart to name a few. The company has received numerous awards for innovation, including the Dell/NFIB Small Business Excellence Award, and was featured on the 1000th cover of Rolling Stone. For information, contact us at (310) 639-6000 or complete our online contact form. We were thrilled to recently receive some fantastic feedback and photos from one of our clients, Event and Stage Designer Brad Doran. 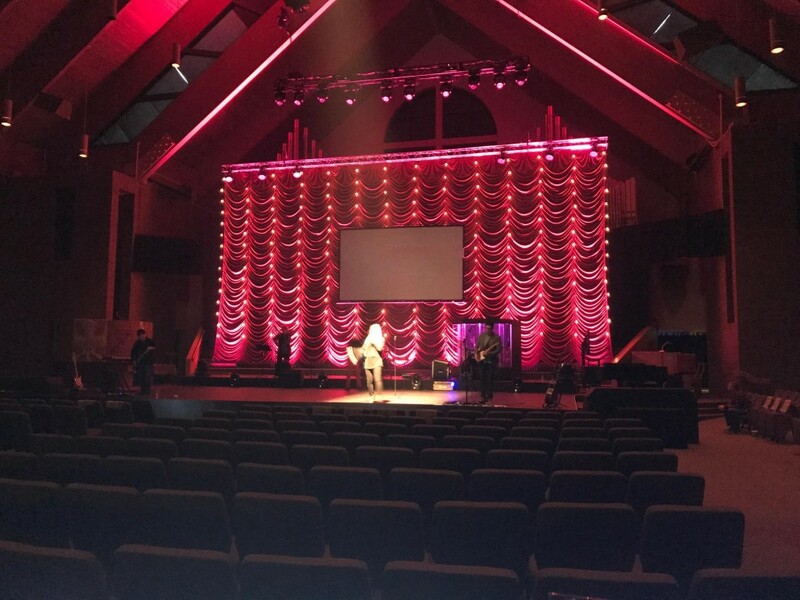 He was working on a special event at the East 91st Christian Church in Indianapolis, and he needed a spectacular showpiece that could not only be used at this event, but could be diverse enough to be used at other types of events throughout the year, too. He also wanted something easy for his team to install and hang without a lot of muss and fuss, but still be something completely breathtaking that would really wow their audiences. With the help of Sew What? Account Manager Marilyn Moss, he decided to have us make a custom-built 25’h x 50’w Burgundy Super-Vel Non-Operable Austrian Backdrop, and it really turned out magnificent! With approximately 25% horizontal fullness, and 100% vertical fullness, this drape didn’t need to move up and down to really dazzle the stage—its incredible depth and texture thoroughly and easily enhanced the event’s design in the most captivating way. 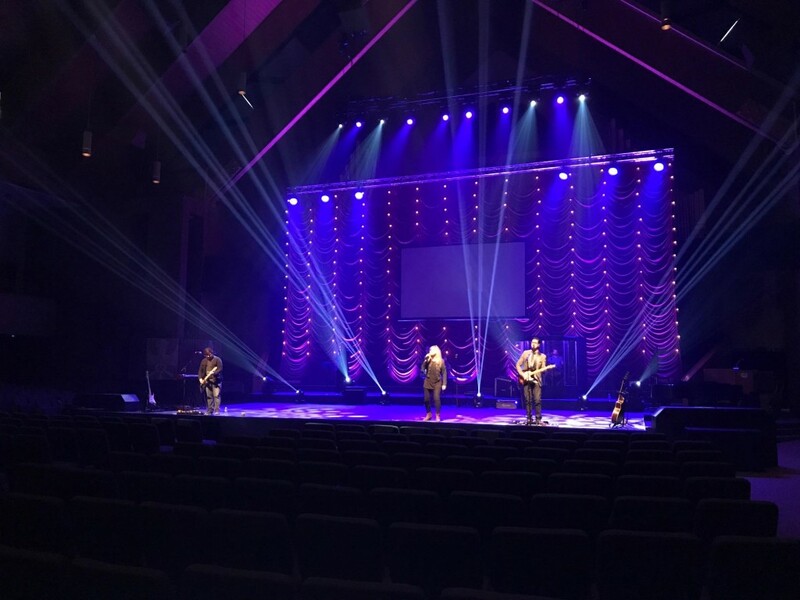 What some of our clients might not always realize is that by adding theatrical stage lighting they can really change the overall look and feel of almost every type of color and textured fabric for their stage drapes, even when they think the color might be darker than ideal for “altering” the appearance. In this instance, Brad knew that their specialty stage drape should be made with lightweight, velvety and inherently flame-retardant Super-Vel in the slightly darker shade of burgundy (rather than the typical silver, white or ivory that is often used when making Austrian drapes). This fabric is not only durable and decadent, but it also reflects light just beautifully. The end result on stage was absolutely lovely in natural lighting, but became truly remarkable when their lighting team cast different shades of theatrical stage lighting onto the drape, as well as adding vertical light strings along the each line of swags, which added a very special touch to the entire event’s ambiance. We were so happy that our client got the exact style of drape that they were envisioning—let our team of drapery experts help you to do the same! Being in the theatrical drapery business, it might be said that backdrops big and small come and go at a great pace. However, on the day-to-day level we aim to treat all our rock n roll clients with the same level of professionalism be they an established A-Lister or an up and coming artist. We don’t discriminate on concert size, venue location, or what type of music the artist performs. I will confess, however, that there has always been an off the record “bucket list” of clients that we would just dream to one day make a backdrop for. For each of us on the customer care team, the list tends to be different, and usually influenced by where we grew up and what we listened to as a child. Influential artists that meant something during our formative years, or music that got us thru either good, or bad, times. While I can’t speak for the team here, I must say that the untimely passing of George Michael came as a real shock to me personally. This was an artist whose music, from the early Wham! days, was purely and simply the soundtrack to my teenage years. I remember birthday parties and high school dances peppered with tunes such as “Young Guns” and “Bad Boys.” While the musical duo Wham! were British, growing up in Australia they were a part of our everyday radio play………… for years. Who could forget “Wake Me Up Before You Go-Go” or didn’t want to sing along with “Careless Whisper.” I know all the words. 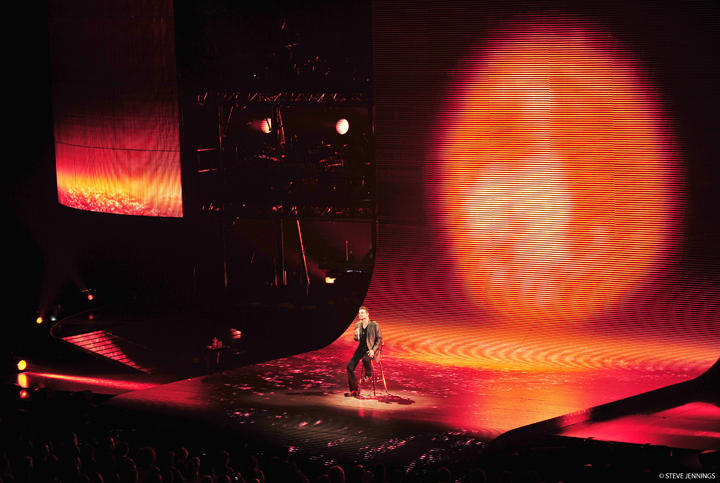 For me personally – when Benoit Richard contacted us to craft a drapery package for George Michael’s tour some years back, it was like all my high school dreams had come true. Certainly – this was an artist that I was just SO excited to be sewing for. George Michael, along with Michael Jackson, David Bowie and Elton John, were all on that “dream client” list. It was an exciting achievement to be involved in this project for George Michael. It’s not about the loss of a client, however, it’s about the loss of an incredibly talented artist and an influential musician. A couple of images from the tour we were a part of are the memories we have – along with the music of course. Long Live the dance-pop-post-disco era. You may have checked out photos of our prior projects on the Portfolio pages of our websites or on this blog, but did you know that more photos are available on our Flickr page, especially in our Galleries? If you aren’t familiar with Flickr Galleries, this is a feature that allows a user to highlight various photos found in the accounts of a wide variety of other Flickr users, while still linking back to the individual photographer’s account. Creating Galleries has allowed us to show photos taken of our projects by many people throughout the world who attend the various concerts that feature our custom stage curtains and rental stage drapes as part of the set design. 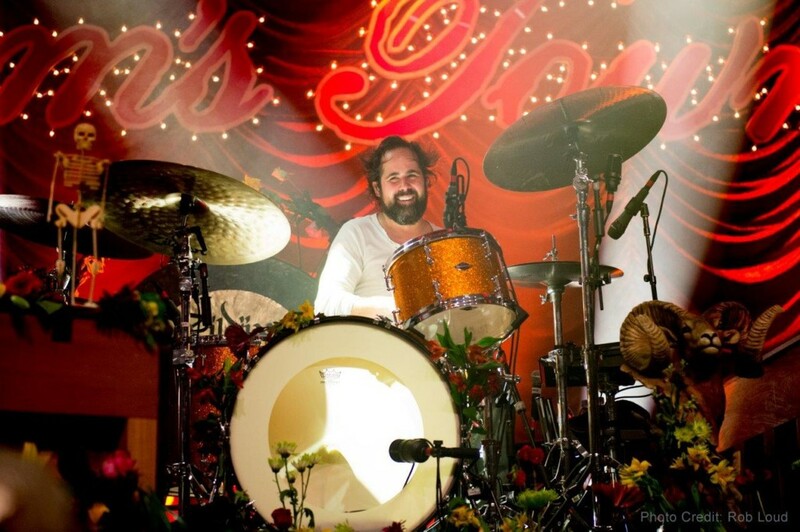 A few months ago, we blogged about the gorgeous combination of Black Chrome Austrian Drape and Crimson Encore legs and borders that the Killers rented for their recent tour. That blog post featured the photo above along with two other photos by band photographer Rob Loud. Not long ago, we discovered some wonderful photos of the tour on Flickr and decided to create a gallery of The Killers featuring these beautiful photos. 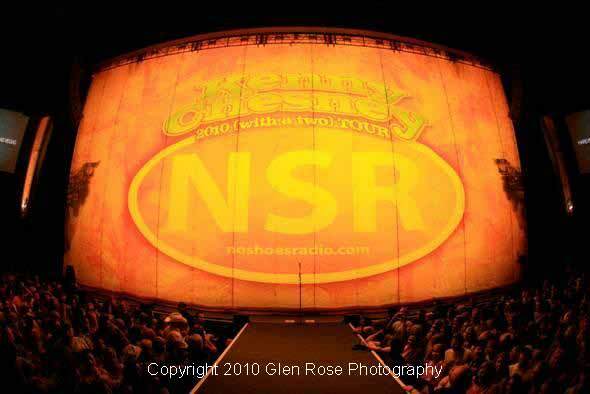 Having made digitally printed backdrops for Kenny Chesney tour for years, we have featured several of these backdrops on our Digital Printing Portfolio page as well as on this blog. With so many different backdrops over the years, our Kenny Chesney Tour Flickr Gallery is a great place to see all of them in one place. Featured in this blog post as well as in our Theatre Portfolio, this was a beautiful romantic set design featuring White Voile swags and legs, and even a kabuki drape! 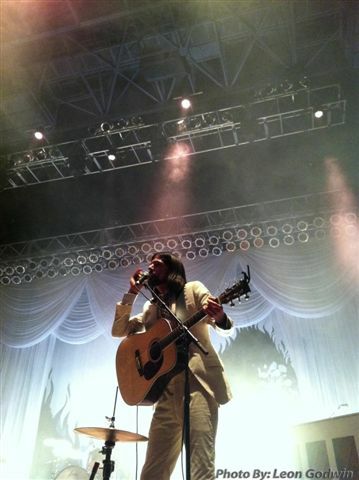 I love the many different shots available in our Avett Brothers New Years Eve Flickr Gallery. If you want to check out the remaining 60+ Galleries, visit our Flickr Galleries page here, or visit our main Flickr page for our own photostream and albums. In our next installment of “Meet The SW? and RW? 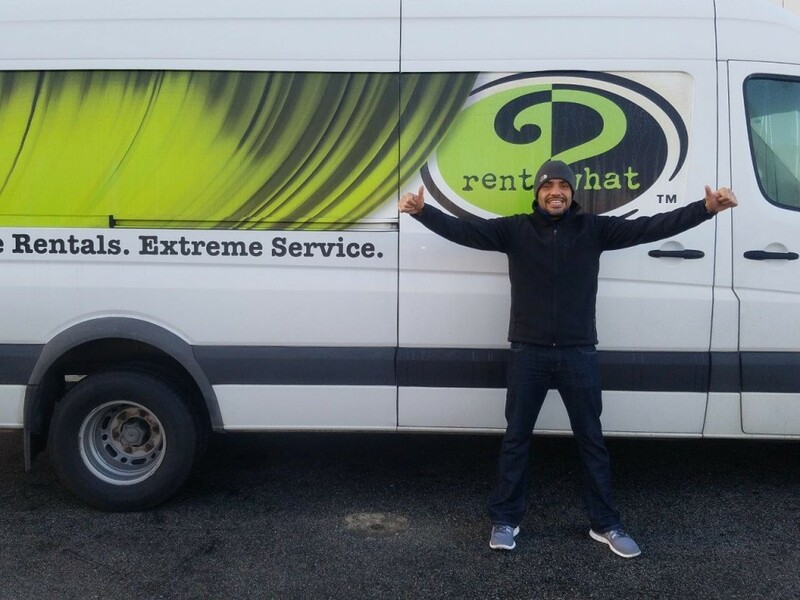 Staff” blog series, I’d love to introduce you to one of the most genuine, hard-working, and all-around helpful members of our Whatter’s Team whom we are extremely lucky to have as our Company Driver, Juan. Being so capable with all of his many skills and strengths, we use Juan in every warehouse department that we possibly can when he’s not out on the crazy roads of LA, the Valley, Orange County, and everywhere in between. And always with a joke and a smile, he truly is an absolute pleasure to work with on a daily basis, too. Please take a moment to hear, from his own words, a little more about one of the greatest people we have on our team….Juan! I was originally hired in 2011 to be the Sew What? Driver, and am now more officially the Company Driver by doing both Sew What? and Rent What? pickups and deliveries. However, I also now assist the warehouse with whatever project or duty they need help with, including Rentals, Shipping, Receiving, and even Printing (which I am having a lot of fun with!). I have always wanted to go to Africa, because it looks like it’s a really beautiful place. It reminds me of Mexico (where I am originally from), so I would like to experience this continent first hand so I won’t forget where I came from. I know the culture and poverty is not the same, but it will help me continue to value what I have. I was also a driver before working here, and did general warehouse duties too. There are too many to name! But I feel like the Sew What environment helps you feel like you are part of a family, which I really love. Team: LA Clippers, Dallas Cowboys, and everyone here knows I am a DIE-HARD Los Angeles Dodgers fan, too! Book: The Thomas Guide (heh heh, because I’m always in the van driving through LA)! I love to run as much as possible, so that I can also cook as much as possible! I love cooking everything and anything—as long as I have the kitchen to myself, I’m a happy man. What personal project have you worked on recently that was interesting or challenging? I have been trying to get into better shape, and have also been working towards running a marathon possibly later this year or in 2018. It takes a lot of discipline, but will ultimately be worth it! Just that I really enjoy coming to work—it’s never the same thing two days in a row!